Giant Fruits Forest Escape info about the game-Games2Rule. 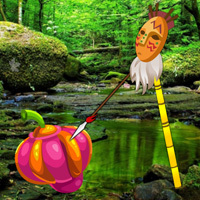 Giant Fruits Forest Escape is another type of point and click new escape game developed by Games2rule.com You are a very brave hunter, so you are looking for some adventure and decided to go for hunting alone in the isolated forest but you are gone misguided there. This forest is famous for giant fruits. You don�t know where you are in forest. Now what will you do? Day is also going to end. You should have to escape from there by finding useful objects, hints and solving puzzle. Click on the objects to interact with them and solve puzzles. Good Luck Have Fun!